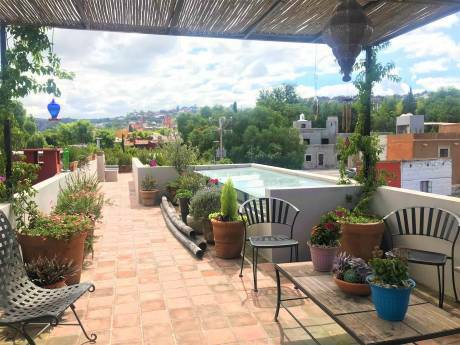 Our home is a new Mexican Modern house with extensive patios and a large garden of over 2000 square meters behind secure walls, with beehives and a chicken and pigeon house. We have an orchard of over fifty trees providing citrus and avocados and other fruits for the kitchen. The garden is a haven for hummingbirds, butterflies and bees of all sorts. The house features an internal fountain, a large open air living area and an expansive sala, dining room and well appointed kitchen on the second floor. There is off-road parking for three cars. There are over 450 sq. meters of patios and decks. The master bedroom is on the third floor with panoramic views over the canyon of the Botanic Garden. It has a king bed and the ensuite bathroom has a shower, bath, toilet and bidet. Canadian satellite HD-TV is provided. The guest room is on the ground floor with a king bed and shower, bath and toilet ensuite. Mexican cable TV is provided. In the ground floor office there is a wi-fi internet connection. We have a staff of three - a maid (who can cook) who comes six days a week, a gardener/general hand (who speaks English) five days a week and a maintenance man who comes on Saturday. The house faces north (to avoid the afternoon westerly sun) and at 1000 feet above the city center is about 10 degrees cooler in the heat of the summer. Ceiling fans throughout the house provide additional cooling where needed. Gas firelogs in most rooms supply heating in the cooler months. Vonage and Telmex phone service is provided. We are a composite couple - he a semi retired New Zealand barrister - she an American interior designer. We are in our mid 60's. We have a lot of places we want to see - but we are lousy tourists - group travel is not for us. So we are looking to exchange a home. Maybe our home is for you; maybe your home is for us. 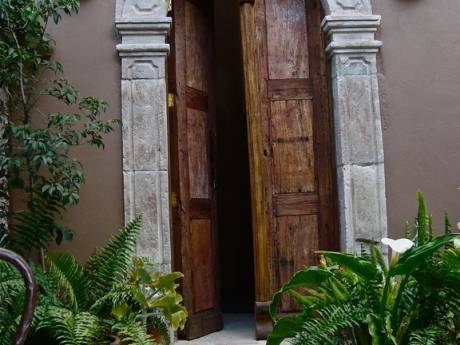 Our house is located in Los Balcones, a genteel colonia above the city center. The colonia has a mix of expatriate foreigners, long time Mexican residents and people from Mexico City with weekend residences. Charco El Ingenio (the botanical garden) which has one of the foremost collections of cactus in the world. We are about a ten minute downhill walk from the city center (a 30 peso uphill cab ride home). The colonia is residential only and very quiet. It is well lit and very secure.